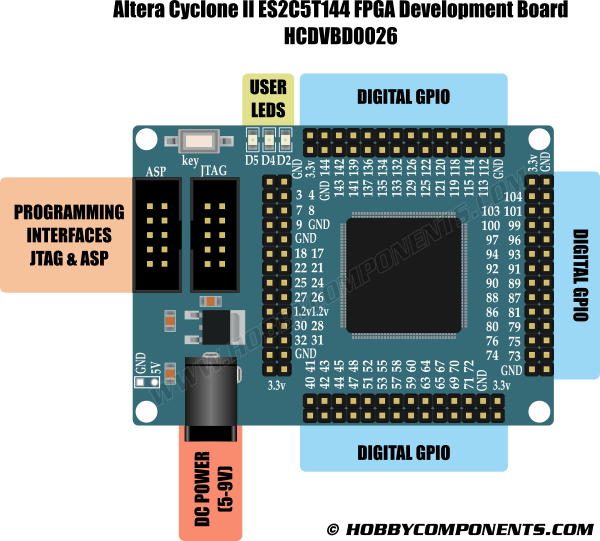 This development board is a low cost way to get into the world of FPGAs and programmable logic. Based on a 144 pin Altera Cyclone II (EP2C5ST144C8N) device this board is a significant step up from our popular MAX II CPLD development board (HCDVBD0006). It features standard 0.1" pitch breakout headers for the devices 89 usable I/O cells, on-board 50MHz crystal oscillator which provides the FPGA's internal clock source, on-board 3.3V & 1.2V regulators with 2.1mm DC power socket, user LED's and both JTAG and ASP with EPCS device programming headers which are directly compatible with our Altera USB programmer (see item HCDVBD0007). On-board 3.3V & 1.2V regulators. Please note: Depending on your design, FPGAs can consume a large amount of power. If you have a complex design it may exceed the capabilities of the on-board regulators. In this case you should power the development board via the power header pins. Each time i remove power my design is lost, how can I permanently program the FPGA? 2) Open up the programmer window in Quartus (Tools->programmer) and in the window that opens up select 'Active Serial Programming' instead of JTAG for the programmer mode. 3) Next click the 'Add device button' and a new window will open. Under the Device name list check the 'EPS4' check box and then close the window by clicking the OK button. 4) In the main programmer window click the 'Change File' button and in the window that opens up navigate to your project area and select the file containing your design. Note that when programming the EPCS device you will need to select the file ending in .pof instead of the .sof file used for programming the FPGA. 5) In the main programmer window you can now check the program, verify, blank check, examine, or erase check boxes as required.